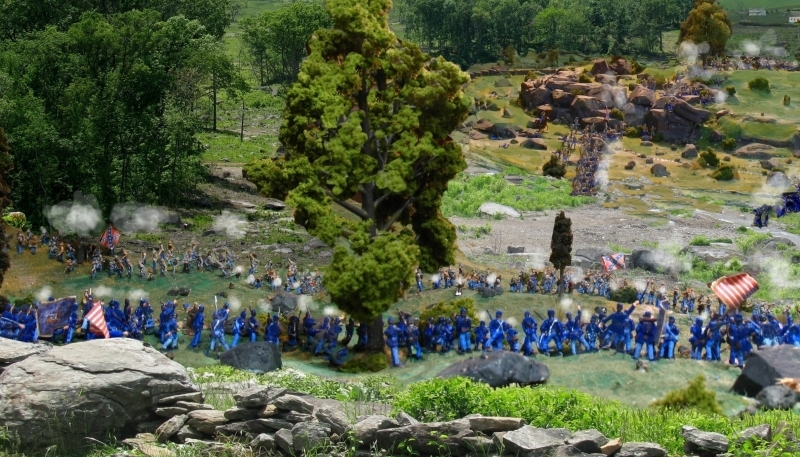 The prosperous rural town of Gettysburg, Pennsylvania, is surrounded by swirling fighting between the Blue and the Gray in this impressive photograph of the Artillery Ridge Campground’s Battle of Gettysburg diorama. 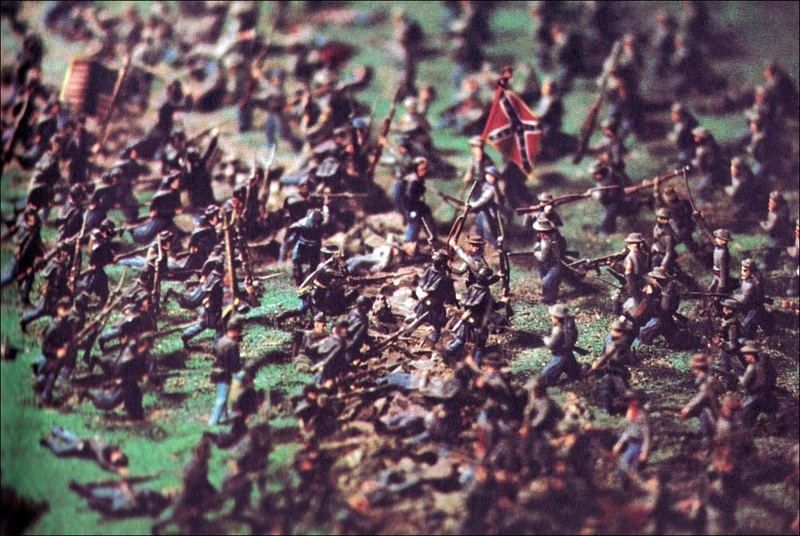 Many years ago, I read an article in Civil War Times Illustrated about a Civil War diorama that had been constructed by a western Michigan man using 20,000+ hand-painted HO scale plastic Civil War toy soldiers (Airfix, Revell, Itali, and several other brands). The huge diorama portrayed the entire Battle of Gettysburg in scale, and was then on display in a shopping mall near Kalamazoo, Michigan. 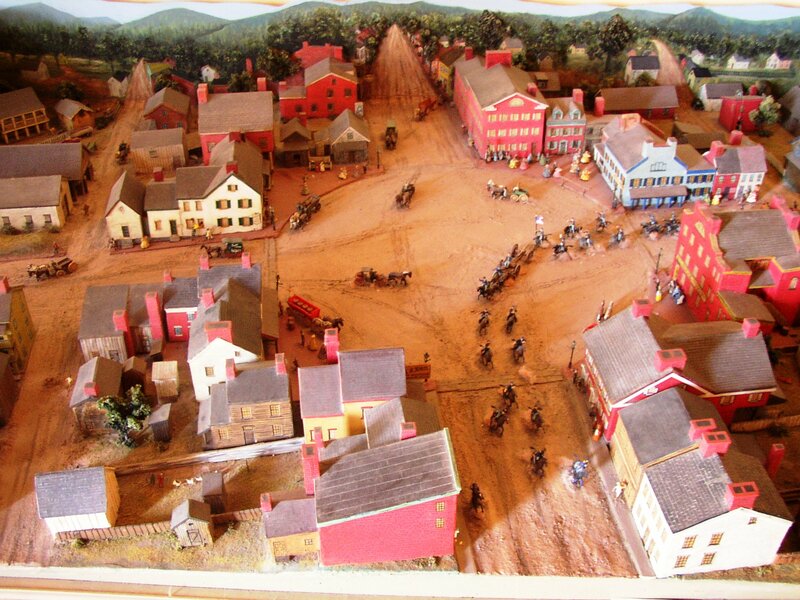 The owner’s dream was to eventually sell the diorama to someone who would relocate it to a permanent place in or near Gettysburg. 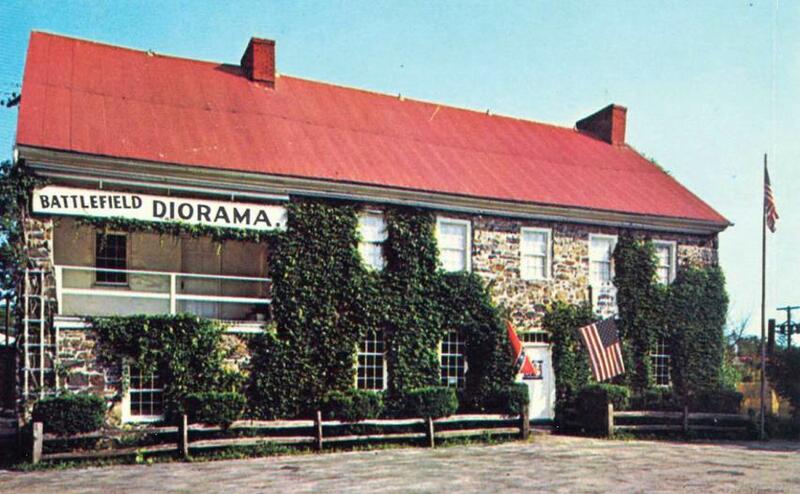 That dream later became reality when the massive diorama was shipped to Artillery Ridge Campground on Taneytown Road in Gettysburg, where has been available ever since for public view for a modest fee. Terrain maker and gamer Randy Miller was kind enough to send me a link to several dozen photographs of this diorama that he snapped while visiting Gettysburg during the 145th Anniversary celebrations last July. Here are a few more photos, as well as a hotlink to his photo gallery. 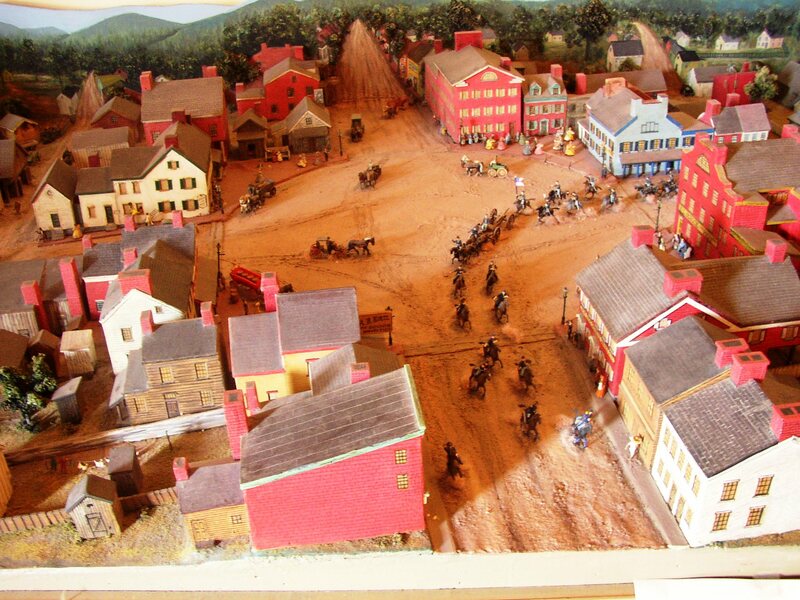 My friend Larry Reber of GettysburgSoldiers.com was kind enough to send me a series of recent photographs he took of the old diorama of downtown Gettysburg as depicted on June 30, 1863, as Brig. Gen. John Buford leads his cavalry into the town square. They are headed west of town to the ridges near Marsh Creek, where videttes and patrols will keep an eye out for Confederates advancing from the west. Additional troopers will fan out north of town, watching for Ewell’s Corps coming down from Carlisle. 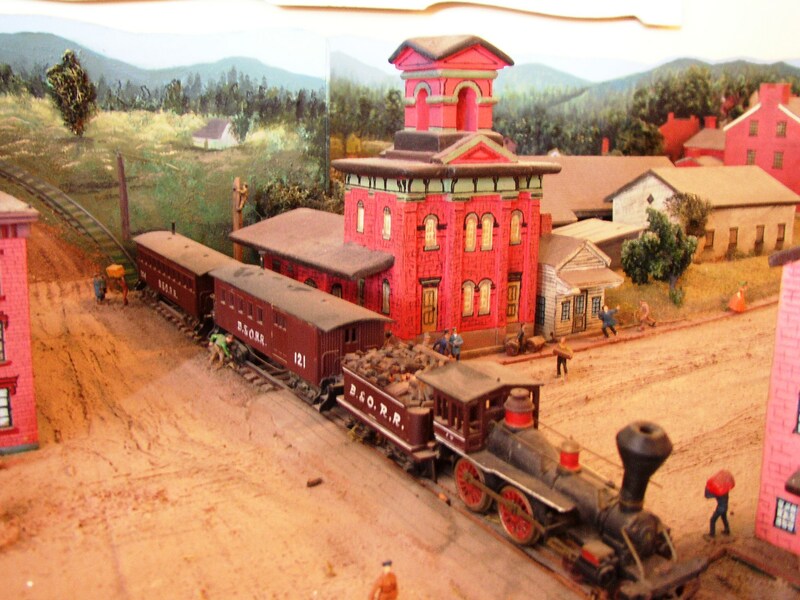 The diorama originally was part of the old Charley Weaver Museum on Cemetery Hill, which went under new ownership after “Weaver” died (his real name was Cliff Arquette). The diorama is now in the Union Drummer Boy relics shop on Baltimore Street. Over the next few days, I will post nearly two dozen shots of this interesting diorama. While not exactly historically accurate, it does give a good useful representation of the Gettysburg that John Buford would have seen. 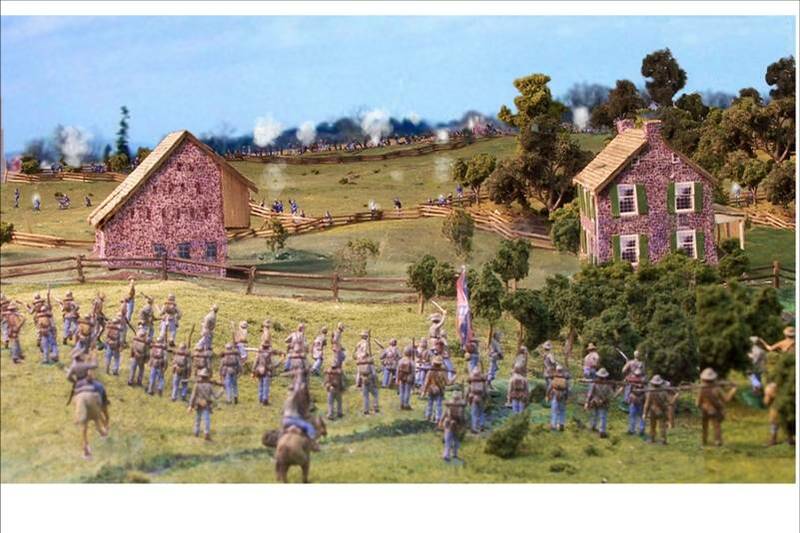 Miniaturist Dennis Morris has taken a series of photographs of his excellent Gettysburg HO scale diorama and made them available as art prints. They are for sale at American Historical Art in downtown Gettysburg (34 York Street, just east of the town square), as well as over the Internet directly from Dennis. 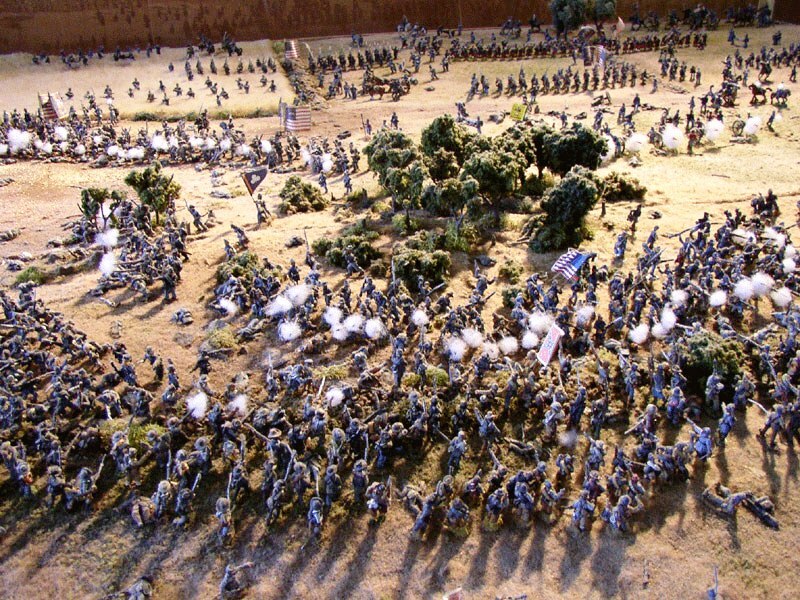 They cover the southern portion of the second day’s fighting at Gettysburg and depict the miniatures in action, set against a photographic background of the actual battlefield. Some of these are really nice. Fans of the Irish Brigade will want to have a look at Dennis’s work, as well as South Carolinians who follow Kershaw’s Palmetto brigade. South Carolinia Confederates from Kershaw’s Brigade approach the Rose Farm at the Battle of Gettysburg in this photo of an outstanding privately-owned Civil War diorama. Click on the photos to enlarge them. Fellow www.militaryhistoryon-line.com message board poster Dennis Morris may have the very best Civil War diorama I have ever heard of. He sent me a few photographs with permission to reproduce them in my upcoming Brother Against Brother ACW scenario book, Brothers Divided. Here are a few more photos – note the detail and quality of this layout! Huzzah Dennis, huzzah! 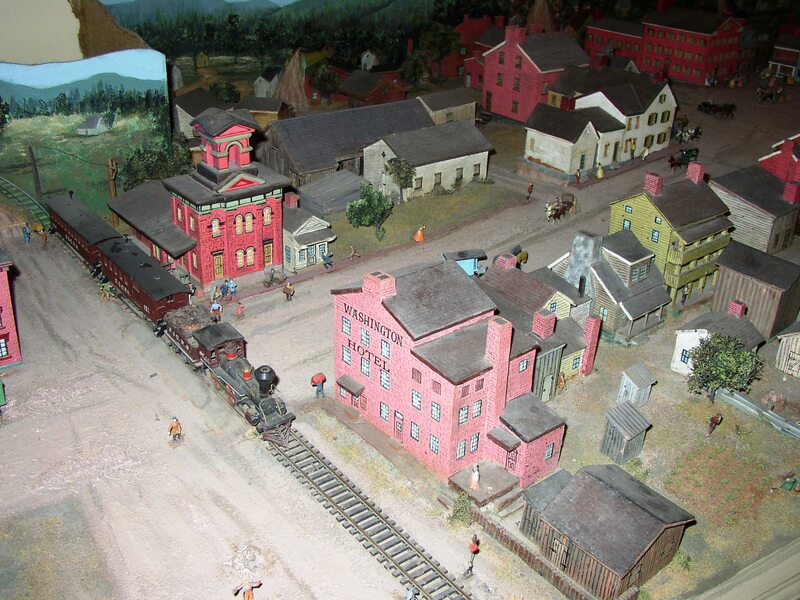 Watch for the new scenario book to see photographs of several ACW layouts from the masters. And, if you have a Civil War diorama you have made, please inform me and I will consider adding yours!